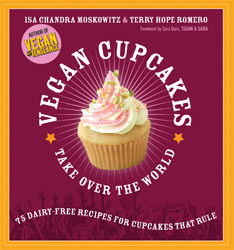 A companion volume to Vegan with a Vengeance, Vegan Cupcakes Take Over the World is a sweet and sassy guide to baking everyone’s favorite treat without using any animal products. This unique cookbook contains more than 50 delicious, cheap, dairy-free, and egg-free recipes for cupcakes and frostings — some innovative, some classics — with beautiful full-color photographs. Included also are gluten-free recipes, decorating tips, baking guidelines, and vegan shopping advice.